This easy lasagna recipe is one I’ve been working on since my 7th grade home economics class. Over the years the recipe has been changed probably over a hundred times, but in the last 5 years it has not changed a single time. I finally got to a place with the recipe that I knew this was truly the Ultimate Meat Lasagna. 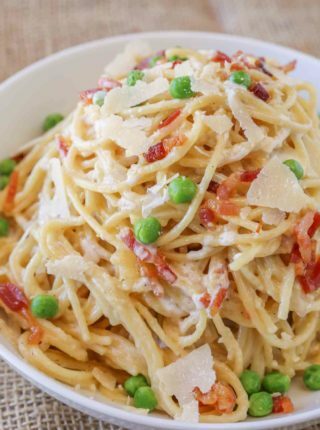 Classic noodles are favored for recipes where you boil the noodles but this recipe calls for the no boil Barilla variety for ease and for the look. The noodles resemble handmade noodles more and serve in a neater way. Homemade Quick and Easy Marinara may not be a real “secret” but it is going to make the biggest difference in the flavor of your lasagna. You can use most levels of quality of cheese and sort of get away with it, but use a sauce that isn’t full of delicious flavors? You’ll immediately notice the difference. I use all beef in this recipe, but the sausage flavor in most restaurant lasagnas is one I love duplicating. To do that easily here without using sausage, I add in some fennel seeds when browning the beef and I brown it in larger chunks. This gives the distinct sausage flavor and the larger chunks of beef help mimic the sausage texture. I add an egg and season my ricotta cheese. This ups the richness of it and makes it taste a little less grainy than ricotta normally does. When serving, let the lasagna cool for an hour or more, cut the slice with a very sharp knife. Remove with two spatulas to ensure no breakage. Top with additional marinara, additional cheese and brown in a 425 degree oven until browned and bubbly. This makes each slice feel like their own “order” with its own set of bubbly cheese and overflowing with marinara sauce. Make the lasagna and let it cool completely (I put it in the fridge). Then slice the lasagna and freeze in single serving quantities. To reheat, add additional sauce on the top with cheese and bake at 350 degrees for 30-35 minutes. Baking pan: I use this one for the perfect edges and to handle more filling. Glass pans won’t cut it for this recipe. No Boil Noodles: Skip the entire extra pan and boiling water, these taste great. 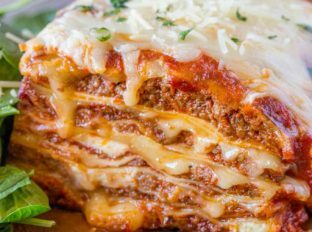 Ultimate Meat Lasagna with four cheeses, a homemade marinara sauce and a few quick chef tricks will make you feel like you've ordered lasagna at your favorite Italian Restaurant. Hi. I made this once before and it turned out great. I have a dinner party coming up and I want to make this again, but this time I’d like to do it in advance and freeze this. How would you best recommend doing that? Cook completely, then freeze, OR get it assembled, then cook the day of the party? I’m so glad you love the recipe. It’ll work either way but I would recommend cooking it the same day, if you have time. Have a great party! My issue is I’ll be out of town until the day of the party, and therefore putting it together the day of the event will be next to impossible. Could I assemble it then freeze it for a few days, then while I’m away have my wife take it out of the freezer a couple days before the party and then just cook the day of? Am I repeating the sauce/cheese/noodle mixture until all of the cheeses run out? Or just one additional time after the first? Until it all runs out, depending on how thick each layer you want. Enjoy! Sabrina I bow to you!! 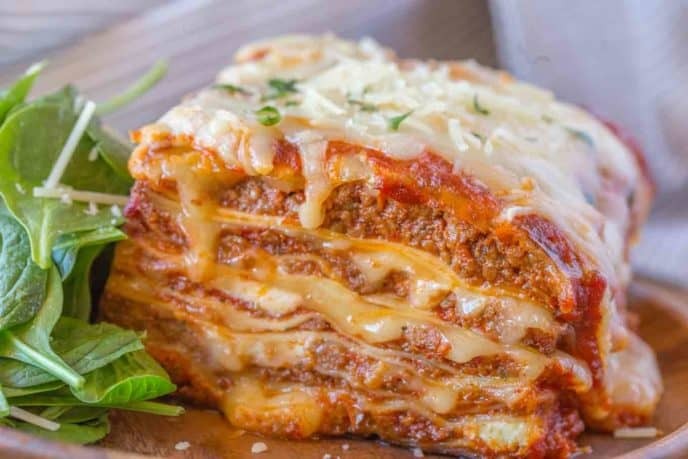 Lasagna is my favorite food and anytime I go out for Italian that is what I order. I am very judgemental towards lasagna and I always find something that just doesn’t hold up to my expectations. It is either to runny/watery, bland, not enough spices, hard noodles, mushy noodles. 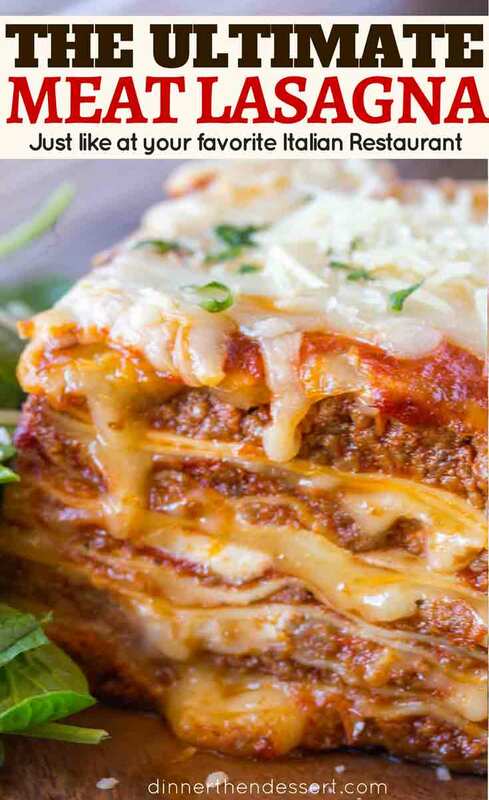 I am always searching for the perfect lasagna and yours is so perfect I died and went to lasagna heaven!!! I made it exactly as the recipe said and it is total delicious perfection! You are amazing! Thank you! You are so sweet, Julie! You just made my day! 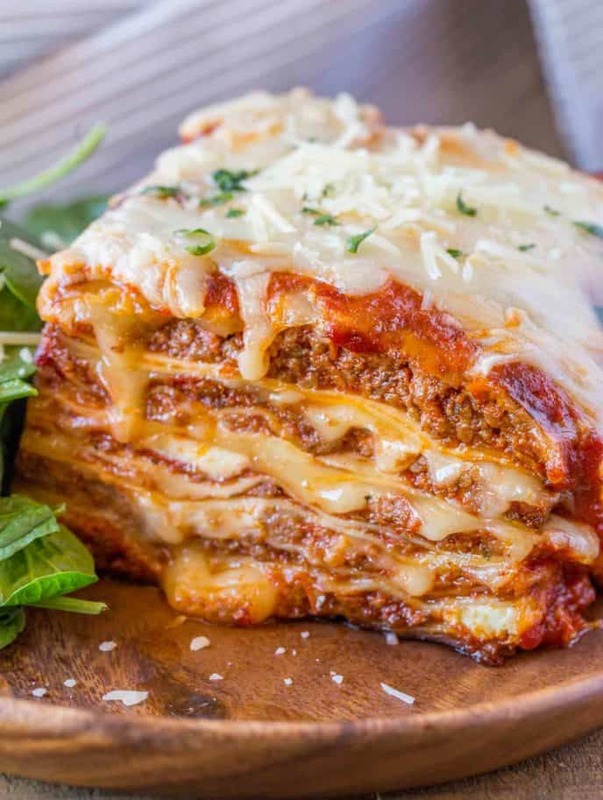 I have a question… for the lasagna recipe in the oven, you layer it by noodle, cheese, then meat sauce, and end with a layer of noodle topped with mozzarella and Parmesan cheese. 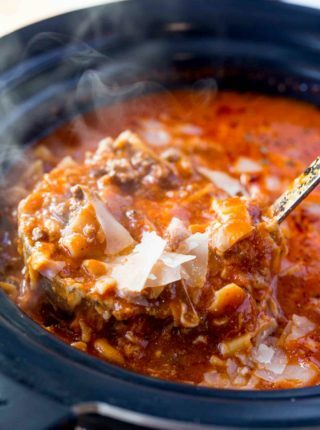 For your slow cooker recipe, you layer it noodle, meat sauce, then cheese, and there is no last layer of noodle with cheese on top for this recipe. Any particular reason for the 2 differences? Yes, there’s a reason. 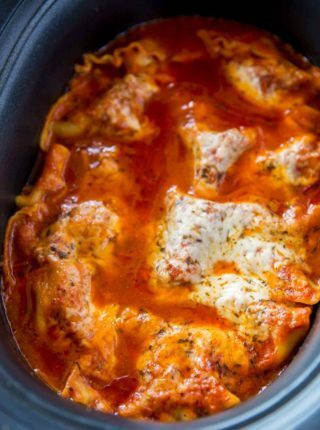 In a slow cooker, you don’t want to have cheese (moisture blocking) next to the noodles. It will cause the noodles to become hard and inedible. You don’t have that same issue when it’s cooked in the oven. Hope this helps! Hello! This looks like an amazing recipe! Thank you for sharing! I plan to make it for my father-in-law’s birthday. I was just wondering if the homemade marinara sauce recipe will make enough for this. I’m scarred I won’t get 6 cups from it. Also, do you think the recipe will easily feed 6 adults? I’m terrible with portion sizes. Thanks a lot ? 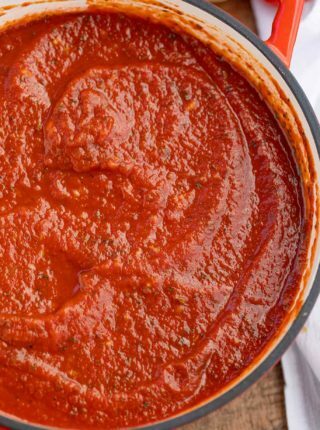 The homemade sauce recipe makes about 4 cups so you’ll need to make a batch and a half or just double it and save the other portion for dipping breadsticks or for another recipe. It’ll definitely be enough for 6 adults. Enjoy! Thank you Sabrina! It was a HUGE success! This is the best Lasagna I have ever had. No kidding! I’ve tried so many recipes over the years and all were just okay. But this one is the best! I made it during Christmas and my family was fighting over it. Now, I NEVER follow a recipe exactly. I substituted half the meat with Johnsonville Mild Italian Sausage and I used more provolone cheese than mozzarella cheese. I also mixed 1/2 cottage cheese and 1/2 ricotta cheese. I followed the marinara recipe on this site and it was great! Wish I could rate this one 10 stars! Thanks! So sweet of you to say! Thanks! This recipe was so good and very easy thanks to your careful instructions. I had already purchase the Barilla Oven- Ready Lasagne, so I was thrilled you mentioned this option. And I already had 2 lbs of ground beef which I was certain was going to be too much, but once again your recipe fit the ingredients I bought before I had an actual recipe. I made one mistake by not reading through to the end. I couldn’t figure out why the parsley was listed in the middle of the ingredient list and so I just assumed it should be mixed in with the ricotta. Thanks for a wonderful cooking experience with a dish I had to make myself. Since I moved to the Sandhills of N.C. I can’t find any place within a 20 mile radius that makes lasagna! I am cooking this for Chirstmas for family. I am a little nervous on the no cook Noodles, but I am going to try it. It was much easier to prepare. I am planning to have this tomorrow, so after cooking today and cool, should i just refrigerate rather then Freeze? Then just follow the re heating instructions? Anyway I am very excited to see how this comes out . Yes, just keep it in the refrigerator. Merry Christmas!